June was so rad! We played some shows, met some new people, heard some great music, and ate some fine pizza. What's better than that? We want more of it, all the time. Special thanks to everyone who hosted us at a show and/or put us up for the night on the road. We are so grateful and you have good karma coming at you in spades. We're busy working on our Cassette Store Day release - three songs! It will be the first Three-Sided-Single released on Trimming The Shield Records, and will be a sneak peak into the direction we're headed for the full-length. 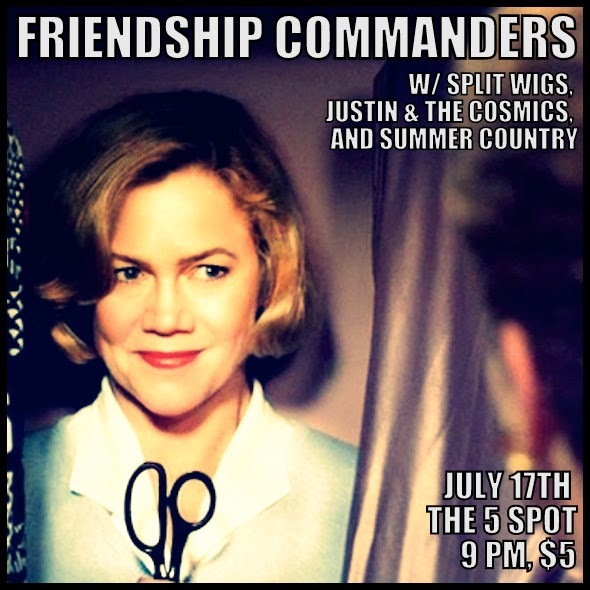 We're also playing a hometown show this month on the 17th at the 5 Spot. Come hang if you're around! © Friendship Commanders 2012. Simple theme. Powered by Blogger. Copyright © 2012 - 2019, Friendship Commanders. All rights reserved.